Jodie Foster might not have been seen in front of the camera since 2013’s Elysium (though given her undefinable British/South African/French/American accent in that film, can you blame her? ), but she’s been making her own path in the meantime behind it. In addition to her previous films as director Little Man Tate, Home for the Holidays and most notably The Beaver, the Oscar-winning actress has also done several episodes of shows like House of Cards and Orange Is The New Black, further solidifying herself as one of the few actors-turned-directors who are just as capable behind the scenes as they are acting in the scenes. Her latest theatrical outing as director is also her biggest and most ambitious project to date, tackling themes like Wall Street corruption, media influence, treatment of the working classes, and George Clooney dancing around a TV set with a golden top hat and hip-hop dancers. 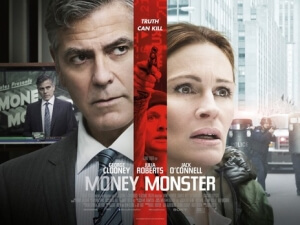 They all come together to form Money Monster, a devilishly entertaining thriller which, though not without setbacks, makes for an extremely engaging sit that will have you laughing, shivering and always on the edge of your seat – much like George Clooney dancing around a TV set with a golden top hat and hip-hop dancers. Clooney plays Lee Gates, the host of popular financial TV show ‘Money Monster’, while his producer and friend Patty (Julia Roberts) controls everything from a booth and via an earpiece in Gates’ ear. While taping a live episode, a young man named Kyle (Jack O’Connell) walks onto the set with a gun and an explosive vest which he forces Gates to wear, holding him hostage while the camera are forced to keep rolling. As it turns out, Kyle is disgruntled from losing all his savings after Gates delivered on-air advice on a company’s stock before a “glitch” cost investors $800 million, and now he’s demanding answers – which, as Gates, Patty and several other people start to discover, may lead to a giant conspiracy involving the company’s CEO Walt Camby (Dominic West). The movie plays out in real-time, which adds a sense of immediacy to the situation without feeling so sluggish and bloated; we are right there with these characters as they are forced to think on the spot about how best to deal with the mess that they are in, and how they react to learning about how their worlds are based on lies and deceit. We are thrown into the scene from different angles, including the intense showdowns in the television studio, the police operations outside and eventually inside the building, and further external forces like Camby’s CCO Diane (Outlander’s Caitriona Balfe) who are investigating Kyle’s claims to seek some legitimacy. All of them pile on top of one another to create something that captures the attention, but not necessarily the imagination, of the audience; every time we see Gates try to talk down the erratic Kyle from blowing up the studio as well as himself, we see the struggle that both he and his captor are going through as they plead on national television for answers, and because it’s all playing out right as we’re seeing it through some tense and often wicked direction by Foster, as well as some top-notch acting by Clooney and O’Connell (Roberts also does great work here, as the one with the most responsibility to show the drama as effectively on-screen as possible), their cries for help are completely believable and keeping with the grounded feel that the real-time narrative has established. We say that it doesn’t necessarily capture the imagination of the audience, if only for the reason that its core narrative, while effectively handled by Foster and co, isn’t entirely original to movie-goers. Some will instantly recognise the blend of films like Network and Dog Day Afternoon, one being a media satire and the other about a lone gunman who has more sympathetic intentions behind his crime, while its core messages of greed being good and selfish TV personalities learning to not be so selfish are nothing new, which does prevent this from being a truly ground-breaking movie, instead of just being a pretty good movie. Foster also handles the overall commentary of financial crookedness a little too on-the-nose, sometimes coming across like a Bernie Sanders supporter than someone with an actual point to make, which isn’t helped by the black-and-white approach this movie makes towards portraying anyone in power within the financial district, mostly West’s Camby who, in his fancy suit and smug self-involved grin, is cartoonish to a fault. O’Connell’s Kyle is also hard to fully sympathise with, mainly because he foolishly made the investment in the first place without really thinking about it (something his pregnant girlfriend scolds him for, in a scene that will have you both laughing and feeling shocked about). That is offset by the true entertainment factor this film luckily keeps consistent with, unafraid to bring in moments of black comedy during otherwise intense scenes – at one point, Patty tells a cameraman to get a better angle on the irate gunman Kyle to avoid some bad lighting – and always keeping the focus on exactly what it needs to focus on, which is thankfully an interesting conspiracy you want to know more about. That should be about enough for Foster to be proud that Money Monster, her finest film as a director to date, is a real monster in the positive term. Money Monster sees director Jodie Foster tackling heavy subjects like financial corruption and media influence, and with the help of great actors like George Clooney and Julia Roberts she pulls it off to make an entertaining and highly engaging real-time thriller that will have you hooked from its very first moments onwards.